Thanks just got it yesterday. Loving it so far. They wanted $21,500 for it and I talked them down. Great looking car and great deal! What area are you in Jmillien? Beautiful car! I’ve always thought the ST looked best in black, it’s just difficult to clean. But a ‘17 ST3 for 18k is an amazing deal. You could flip that car right now & make a few $$. about how this would hold over time) as well as the logo on the side skirts. I ended up getting it for $22,500 plus TTL. I honestly thought I could do better but the dealer was in no hurry to get rid of it and frankly I need a new car. My 11 year only Mazda 3 needs brakes and rotors all around plus some front suspension work and I did not want to put any money into it. Seemed smarter to just sell it privately as-is. I was not seeing many other 18 ST3's within a hundred miles or so to me with that low of mileage. I could have saved a couple thousand more for a '17 with around 12k miles but just felt more comfortable with this particular '18 as it still has almost 30 months of warranty left and came from the same Ford dealer that sold it originally. I'm sure as time goes by more 18 ST3's will be coming on the market and perhaps pricing will get a little better. More importantly I really love how the car drives! I drove it from Cincy back to Columbus (about 100 miles). It was all interstate so not much chance to do any corning but nonethless, power is abundant (to me anyways) and delivered very smoothly, I'm keeping it all stock and plan on adding the Husky floor mats and ZL1 mud flaps. I just need to be aware of the LSPI issues although I typically downshift out of overdrive so shouldn't have to change my driving style much. Appreciate all the help and advice from PokerRun388, Cjinohio03 and a bunch of others on this great site. Congrats man! I love the ST! And white is so easy to daily drive & keep clean! I’m noticing that used prices on ST’s seem to actually be going up, at least in my areas. Most ST1’s in CA. are now around that 20-21k range vs. last year where they’re were around 18-19k. The ST3’s are so rare & I haven’t seen one pop up locally to me in months. The last one only had like 15k miles & it was gone within a week. Everyone wants that upgraded infotainment system. Thanks..looks like my post got cut off. Was doing it mobile. Anyway, just meant to say I had the dealer remove roof wrap removed which I liked but was unsure how it would look in a few years. Also had them remove the BFP logos on the side skirts. Can you talk about some of your initial impressions of the car overall? The ride quality, how it shifts, the MPG & the seats? 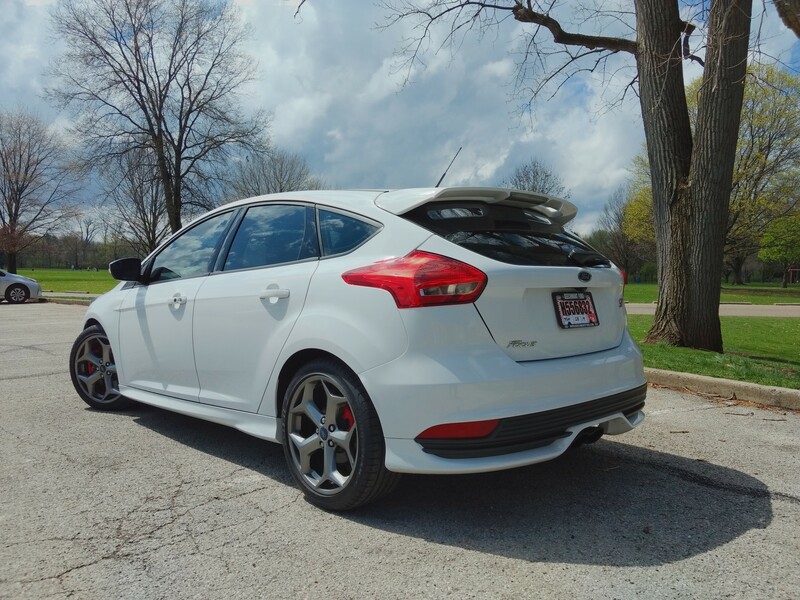 I’m kind of all over the place as far as getting an ST or RS. Is the ST fast? Keep in mind my most recent reference is an 11 year old Mazda 3 which still runs fine but was definitely getting a little tired. So compared to that, ride quality of the ST is quite a step up and I was surprised at how quiet the stock exhaust was. The car is just really tight and is very fast compared with what I’m recently used to. I could never see myself spending north of 30K on a car so the RS was never under consideration although it would be fun to take one for a test ride just to compare to the ST.
As far as the Recaro’s are concerned, I guess you either love them or hate them. I had them in a ’90 Golf GTI 16v and have always wanted another car with a set. I’m 6’1” and 168lbs so on the slim side. I can see why some people might not like them if their proportions were different. Seats are probably are on the hard side but I don’t spend long periods of time in the car so probably won’t be an issue for me. I might do a 1000 mile road trip later this summer so will see how they feel after a few hours. I don’t daily drive a huge amount so honestly don’t pay much attention to the MPG. I’d fill up my Mazda 3 maybe twice a month so will see if that stays the same with the ST. It’s just a 4 banger and I don't have a lead foot so how bad can it be? When I look at all the people driving Silverado’s, F150’s and full size SUV’s they have to be a lot worse. I do find it funny how people complain about the 12 gallon gas tank. I thought all small cars were like that. My Mazda 3 was only 11 gallons. I’m finding the Sync 3 system to be absolutely fantastic and so intuitive. This is the first car I’ve had with an Infotaninment system and I had it sync’d up to my phone, connected to home wifi, and using the voice commands in minutes. The cargo area seems a little small and wish the back seats would fold down completely flat. I can’t remember the last time I got a flat tire but good on Ford for putting in a full size spare! Although maybe they could have put in a bigger gas tank that everyone complains about with a space saver tire. Other than that I hope it can give me the same reliability as the Mazda did. Outside of regular maintenance I never had a single issue in the 11 years that I owned it so expectations are high. The cargo area seems a little small and wish the back seats would fold down completely flat.